This was perhaps the weakest Survivor NZ: Thailand episode thus far, mainly because so much effort was made to change up the game, to so little effect. While things happened this episode (the swap, two challenges) not much really changed in the overall game. Yes, a dude was finally voted out, but it was really the same old story, as original Chani continued hemorraging members. Still, the swap was fun, another mid-challenge medical visit was less fun (thankfully, still no medevac), a post-swap Matt chat that returned a forgotten idol was new and different, an immunity challenge that appeared to be a massive physical mismatch turned to be exactly that, and a failed idol play with the newly returned idol finished things off. There was no Outpost, but since there were only two days this episode, and the way the swap was carried out (smashing eggs one at a time, instead of all at once, as in Caramoan) ate up a lot of time, so there was no room. Things happened, but in the grander scheme of things, they didn't happen. Still, there were a few highlights. Let's rip into them. 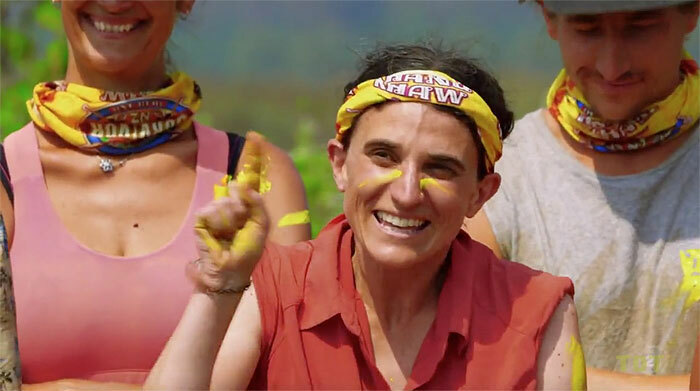 Let's hope that Lisa's being overcome with joy at participating in key Survivor milestones may never gets old, because they're just such genuine moments, and it seems to temporarily disarm everyone around her. (Well, assuming they really are genuine, since Lisa *did* mention intentionally playing up her nerdy superfan/mum aspects to appear less threatening... but if these bits are exaggerated, Lisa is an amazing actor.) In the grand scheme of the game, these are probably inconsequential moments that could easily have been edited out. So it's great that the editors chose to include them, because like laughter and yawning, excitement is infectious. Also it gives Dylan material to reference later in the episode, other than Adam's sneering. It's a pity that post-swap Chani is so overpowered that they may never lose a challenge again. Clearly, New Chani is the tribe that would produce some actual Tribal Council fireworks. Adam still hates Dylan. Dylan wants to flip to join the original Chanis, especially Arun. Arun wants to maybe flip and join Josh. Dave wants to flip and join Matt. Renee would otherwise seem even more doomed than Shay did last season, as the lone woman on a tribe with six men, but there are so many moving parts here that it seems impossible to predict where the whirlwind of numbers will fall. So it's disappointing that instead of this trampoline of imminent flipping, we were stuck with post-swap Khang Khaw going to Tribal instead. 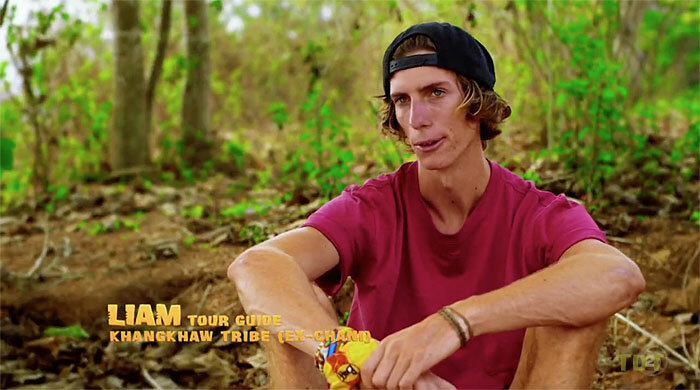 With its tepid yellow majority held together so firmly by Brad, this was the tribe that was voted both "most likely to lose at physical challenges" and "most likely to stick to original tribal lines when voting." To be fair, they did have both immunity idols, and one was actually played. But Eve guessed wrong about upon whom the original Khang Khaws would be piling votes, and that was the end of that momentary intrigue. Mostly, after last week's hype that Lisa might be thinking of turning on Brad, this episode delivered Ghost Island-esque levels of Big Move crushed dreams. Tara and Lisa had no good reason to stick with Brad, for precisely the reasons that Lisa articulated: His prior lack of #StratChats with Lisa (not to mention his not bothering to tell them to vote for Kaysha) was a clear sign they were not key members of his alliance. But they stuck with him anyway, in an apparently prescient homage to Laurel and Donathan. Hooray. There's still some hope that Liam's exit now shifts the numbers into more interesting territory. New Khang Khaw now has three set of pairs: Tara/Lisa, Brad/Tess, and JT/Eve. 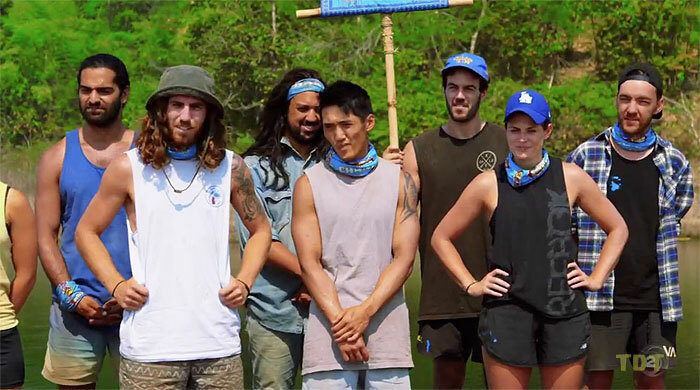 That's similar to the Brains tribe situation in Kaoh Rong, where Debbie first showed she had more to her game than eccentric pull-ups. it might be more fruitful for them to flip now. Five original Chanis plus Lisa and Tara equals a majority if the merge is at 13. While the cleaned-up confessionals by booted players continue to be a glaring problem with the finished product, that error was diffused a bit this week, as everyone who changed tribes seemingly picked up an entirely new wardrobe after the swap. Suddenly, JT had a tiger print shirt. Eve had a bright yellow one. 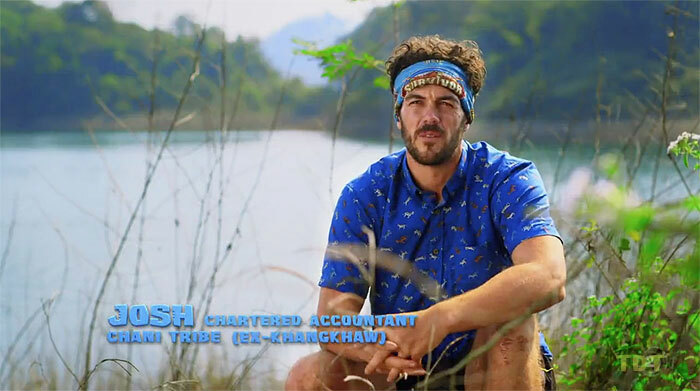 Josh was sporting a dark blue "party shirt." Dylan had both a powder-blue windbreaker and a blue flannel. This is simply not done in US Survivor, but after the initial surprise wears off it's hard to justify why that is the case, really. Similarly, why *does* US Survivor withhold swimsuits from everyone until some point near the merge? Do we really enjoy seeing Survivor contestants wander around in saggy, filthy underwear in that much that it's still entertaining in Episode 5? (Some people probably do, which is cool for them, I guess.) What's really gained from forcing US players to have one set of clothes, total? The most likely explanation is that, well, people liked it in Pearl Islands, so... they kept doing the "clothes on their backs" twist for the next 30 seasons, without really giving it much thought. Even in seasons with no marooning, like Ghost Island. There are probably a lot of aspects of American Survivor that are now more force of habit than actively thought-about events. So it's invigorating that franchises like Australian Survivor, Survivor South Africa, and Survivor NZ are putting fresh eyes on how things are done, and occasionally changing things up, often for the better. As another example, one praised by Ben Martell on twitter: Calling Eve away for a "medical check" that turned out to actually be Matt Chisholm, sneakily returning Eve's idol to her, was a fun moment. In American Survivor, an anonymous SEG employee would just have stuck the idol back in Eve's bag while the tribe was at a challenge, and we would never even have heard about it. But for a few minutes, Dave alertly pocketing the idol (it's against the rules for him to keep it, but he was smart to hide it from the new tribemates)—and Eve fretting about having lost it—was an interesting minor subplot. Matt felt free to tsk-tsk Eve for having a publicly shared idol in the first place. Maybe all this was because this was the first idol ever played? Regardless, it was fun. An unnecessary Buff-o-matic visit - Following Tess's scary-looking mid-challenge medical visit, as she's discussing it, she gives a confessional in a really poorly altered "Khang Khaw" buff (above). Given that Tess was on Khang Khaw both before and after the swap: Why has it been altered? She was on this tribe before and after the swap. Considering she's also lacking the shoulder bandage she was sporting before Tribal Council, the most likely explanation is: with now just 13 people left, the merge must be imminent. Most likely after the next boot, for a nine-person jury and a final three. Why Survivor NZ waited two-plus episodes to interview Tess about her injury is a different question, but they probably had their reasons. The bromance awakens - At last! Matt and Dave were finally reunited after 12 long, arduous days of painful separation. T.ears. But seriously, it's really remarkable that two people who knew each other pre-game would end up on a tribe together, considering this cast contains approximately 50% of the 26- to 28-year-old population of Auckland. What are the odds? 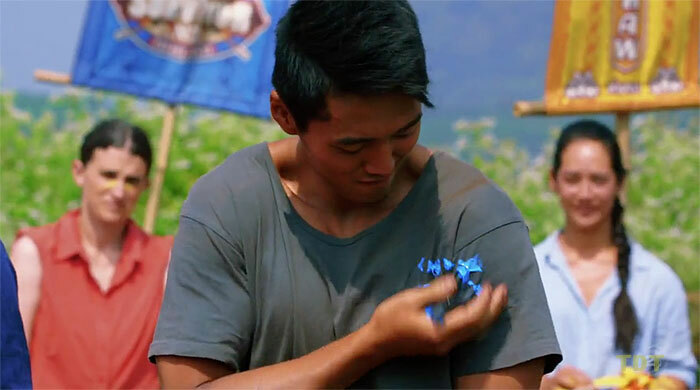 The Tribal misfire - So many things could have gone differently in Khang Khaw's Tribal Council. Not only did Eve guess wrong on her idol play, but the ex-Chanis piled all their votes on the one person from the other tribe who had an idol. And then he didn't even play it! The look of shock on Brad's face when Eve said she was playing her idol was 100% authentic, because he very well could have been forced to play his, had Eve played it correctly. Once she announced she was playing it for herself, though, he correctly declined to do so. Even then, though, that could have gone wrong: if just one of Lisa or Tara had flipped, Brad would have been gone, with an idol in his pocket. A bold non-move by Brad, with an impressive read on his allies. Luke Harries at The Spinoff: "Week 5: Two men reunite, one man goes home"
Kemper Boyd at PurpleRockPodcast.com: "Episode 5 recap"
Chuck Cunningham at InsideSurvivor.com: "A Good Egg"
Ryan Brink at Brink of Reality: "Andrew Torrens Recaps Survivor New Zealand: Thailand Episode 5"
Shannon Gaitz at RHAP: "Thailand Episode 5 RHAPup | Nick Iadanza"
Estelle Clifford at TheHits.co.nz: "Survivor Radio - Episode 5"